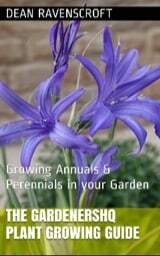 Nicandra plants are usually grown as half hardy annuals in the garden, though they can be half hardy perennials or hardy annuals. 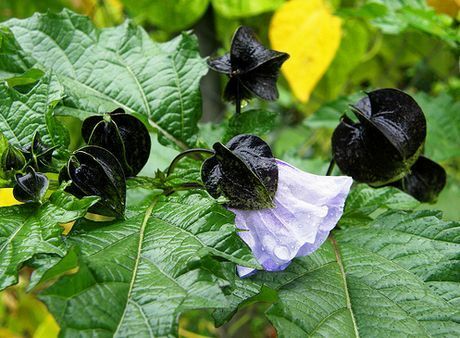 They reach about 90 cm to 1.2 m in height and bloom from summer to Autumn with bell shaped violet and white flowers. They have a very short flowering period and only bloom for one day, but carry long lasting seeds after blooming has occurred. Some common names for Nicandra include Apple of Peru and Shoo-fly plant. Latin names include Nicandra physalodes. em>Nicandra / Apple of Peru photographs by Lillide; creative commons. 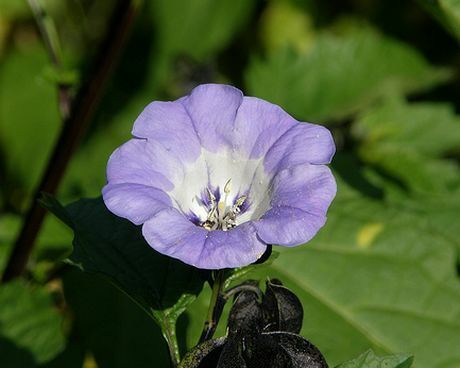 Common Names: Apple of Peru, Shoofly Plant. Height: 36 to 40 inches (90 to 100 cm). Flower Details: Violet. Bell-shaped. 2 inch (5cm) diameter. Sow Outside: Cover seed. Before last frost or in autumn. Spacing 20 to 50 inches (50 to 125 cm). Sow Inside: Germination time: two to three weeks. Temperature 60 to 75°F (15 to 24°C). Seven or eight weeks in advance. Transplant outdoors a few weeks before the last frost. Requirements: Full sunlight or light shade. Good drainage. Rich soil. Monthly feed. Miscellaneous: Considered an invasive species in many areas. The seeds of Apple of Peru can be sown outside either in late autumn or before the last frost of spring; once sown cover the apple of peru seeds lightly with soil. It is best to grow Apple of Peru in a rich soil, in either a partially shaded or sunny part of the garden that has good drainage. When growing Apple of Peru indoors first, do so 7 about weeks in advance. The Nicandra Plant seeds should be germinated at 15 to 24 degrees Centigrade and take about two to three weeks to sprout. The Apple peru seedlings can then be put outdoors, following the last frost of spring with a spacing of about 60 to 90 cm. It is best to feed Apple of Peru and other Nicandra species when they are growing.